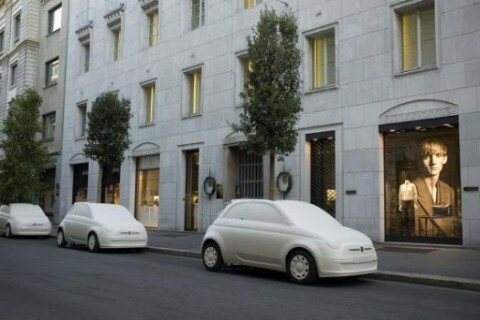 Fiat and designer Fabio Novembre have installed 20 life-size fiberglass replicas of the automaker’s 500 C compact car in Milan each with a tree planted inside. The cars are parked along the Montenapoleone, Milan’s epicenter for fashion and jewelry. The project is called Per fare un albero ‘To make a tree’, and is a collaboration with the Municipality of Milan – Department of Design, Fashion and Events. The idea was to bring some summer shade to the popular stretch of sidewalk in the capital of Lombady. All the 500’s will be parked in their current location till the end of September following that they will be moved to other parts of the city. Spotted over at Swiss Miss. How awesome are these? cool! i have a bunch of family in milan. looks like such a lovely city. I just wanted to stop by and thank you for your bday wishes! Would love to go that city one day!